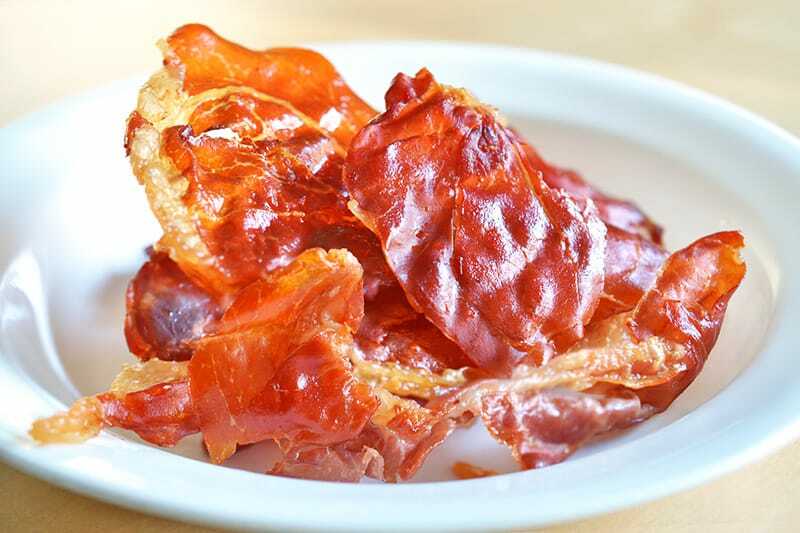 I prefer prosciutto chips to bacon bits because they cook evenly and there aren’t any unappetizing flabby parts. These “Porkitos” also add a terrific salty crunch to creamy soups, salads, and purées. Or you can just stuff your face with them. 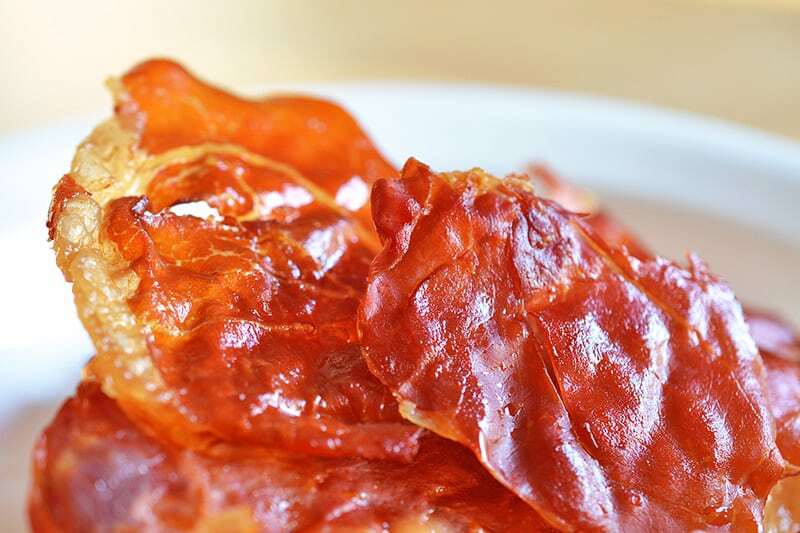 ‘Cause really – who doesn’t like crispy, porky chips? 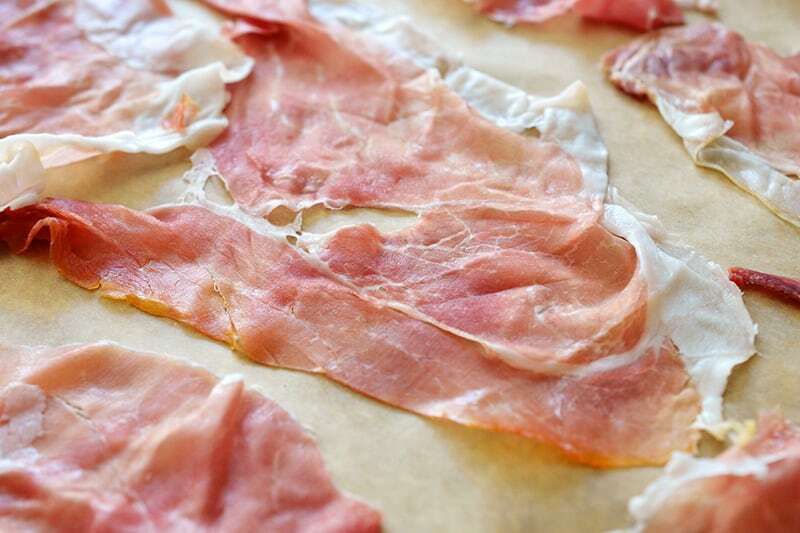 Line a rimmed baking sheet with a piece of parchment paper, and place the prosciutto in a single layer on top. Don’t overcrowd the swine or it won’t crisp properly. Once the oven is ready, place the the tray in the oven. Bake for 10-15 minutes (depending on the thickness of your prosciutto slices) or until crunchy. Watch your chips like a hawk to make sure they don’t burn. Burnt chips make Nom Nom wanna smash things. They’ll actually get crunchier as they cool, so it’s better to err on the side of under-baking them. Look – like stained glass (only swine-ier)! With Brussels sprouts chips, kale chips, mushroom chips, and now PORKITOS, who needs boring old potato chips? 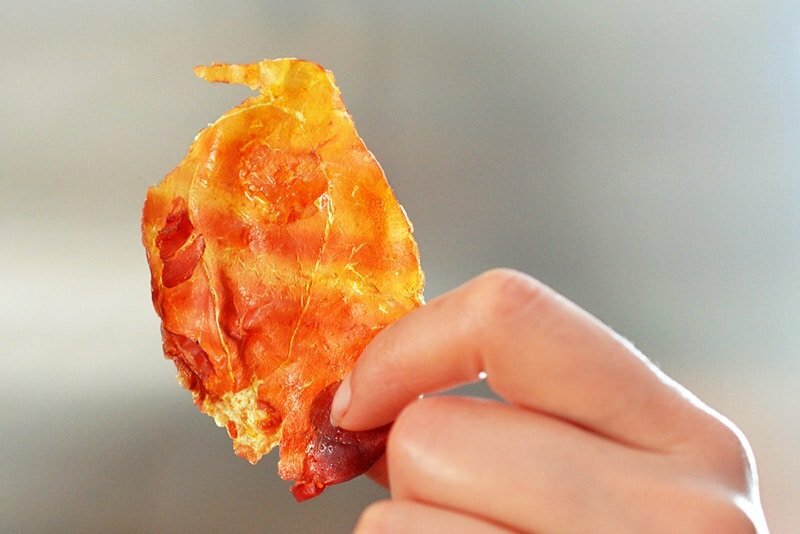 I prefer crispy prosciutto chips to bacon bits because they cook evenly and there aren’t any unappetizing flabby parts. These “Porkitos” also add a terrific salty crunch to creamy soups, salads, and purées—or you can just stuff your face with them. 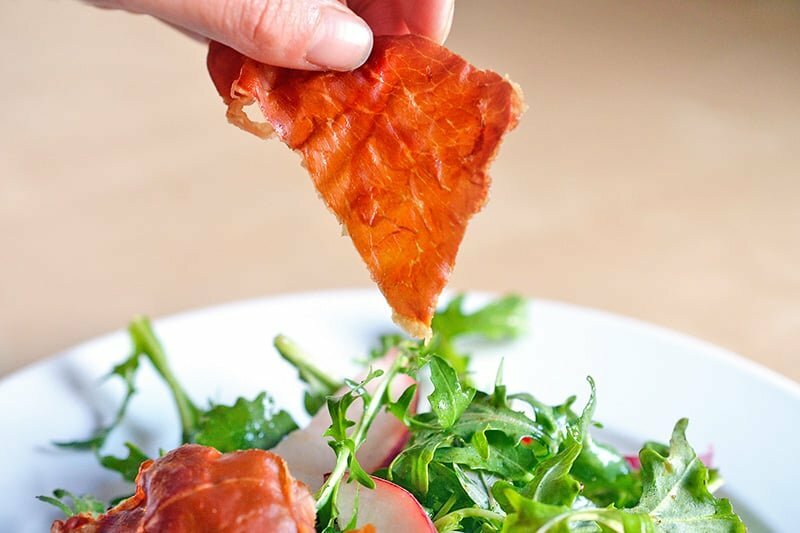 ’Cause really—who doesn’t like crispy, porky chips? 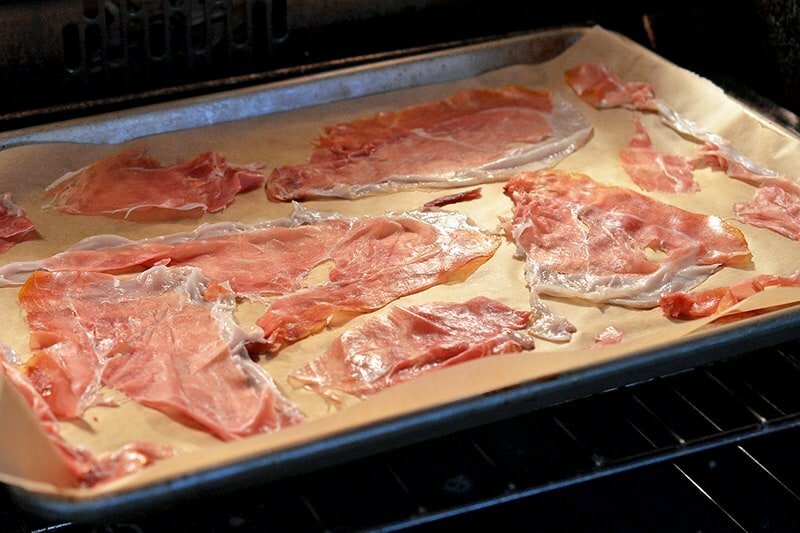 Line a rimmed baking sheet with a piece of parchment paper, and place the prosciutto in a single layer on top. Don’t overcrowd the swine or it won’t crisp properly! Once the oven is ready, place the the tray in the oven. 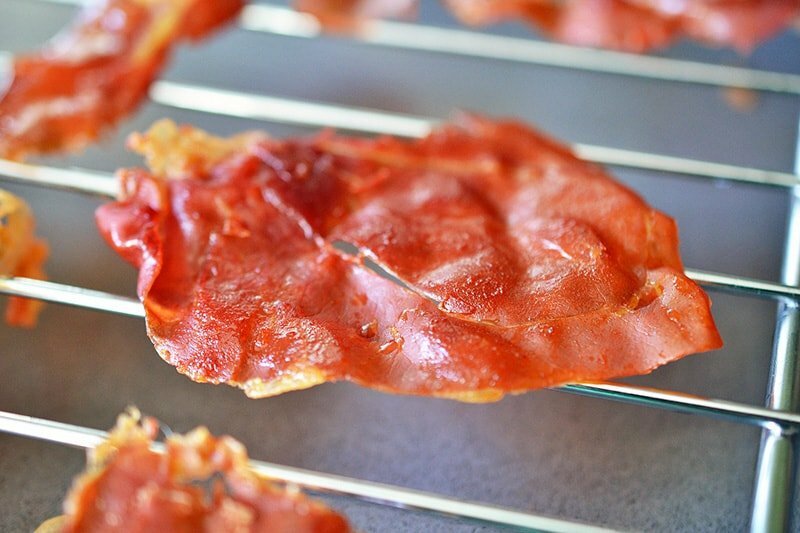 Bake for 10-15 minutes (depending on the thickness of your prosciutto slices) or until crunchy. Watch your chips like a hawk to make sure they don’t burn.